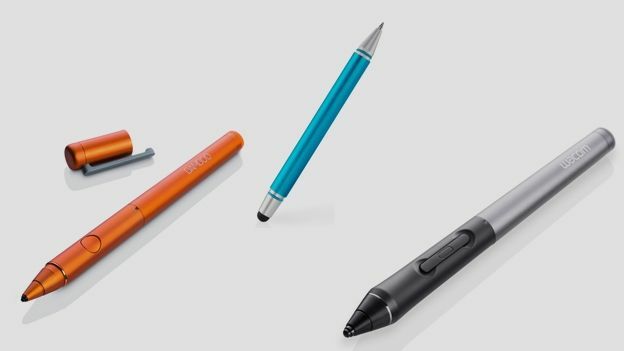 Stylus dons at Wacom have readied up three new e-pens just in time for this year's IFA tradeshow. First up is the Bamboo Stylus Fineline, a smart stylus that touts new 'thin tip' technology that should make it plenty easy to write on your slate. The svelte-tipped stylus can register varying levels (1024, in fact) of pressure and offers palm rejection tech to make sure you don't e-smudge your e-masterpiece. Connectivity comes courtesy of Bluetooth 4.0, and the device should be able to run in paired mode for around 26 hours - after which you'll need to plug it in via USB. The Bluetooth connection also gives users access to Wacom's Cloud services like ControlRoom, which lets you store pen settings, and DropZone, which is basically an ether-based clipboard for file exchanging. "Even in this digital age, people use their hands to express thoughts and ideas," explains Mike Gay, Wacom's Consumer Business Head. "Writing and sketching is still performed to help free minds and encourage creativity. This explains why we continue to develop hardware, software and infrastructures that empower people to do what they want, but be part of that digital lifestyle." Wacom's Fineline will ship in five different colour options, namely silver, grey, blue, orange, and pink. The stylus is available for purchase from Wacoms website right now, retailing at £49.99. Wacom's dropping two 3rd gen styluses this time around, the Bamboo Stylus Solo and Bamboo Stylus Duo. The Solo is purely for touchscreen devices, while the Duo works on capacitive surfaces as well as offering up a hardy ballpoint tip for that retro tech we like to call 'actual paper'. Both variants make use of a new carbon-coated rubber tip that Wacom reckons offers a 'smooth and near-natural' writing experience. There's also six colours up for grabs: shiny blue, bright green, sunny orange, silver, grey, and "girlish pink for the 'fashionistas'". Really, Wacom...? Finally, there's the Creative Stylus 2, which sports a 'fine solid tip' which should improve screen visibility when sketching. This professional-targetted e-pen now boasts USB charging and a side-switch for bonus functionality. It's also super sensitive, with the Stylus 2 able to register 2,048 different levels of pressure, double that of the Bamboo Stylus Fineline. The Creative Stylus 2 will, of course, have access to Wacom's various cloud services along with the other new additions to the line-up. The stylus is certainly an attractive piece of tech, crafted from brushed aluminium with a 'soft touch' silicone grip. It's set to ship in black and grey, and will also come with its own protective carry case which will hold the stylus, USB cable, and replacement nibs. Wacom says its CS2 will work with Wacom's Bamboo Paper, and is optimised for the iPad 3, iPad 4, iPad Mini, and iPad Air. It's available from today, and will hit your wallet for £64.99 sterling.